Grave guards are the focus of this Amos Rank & Co. trade catalog from 1875. 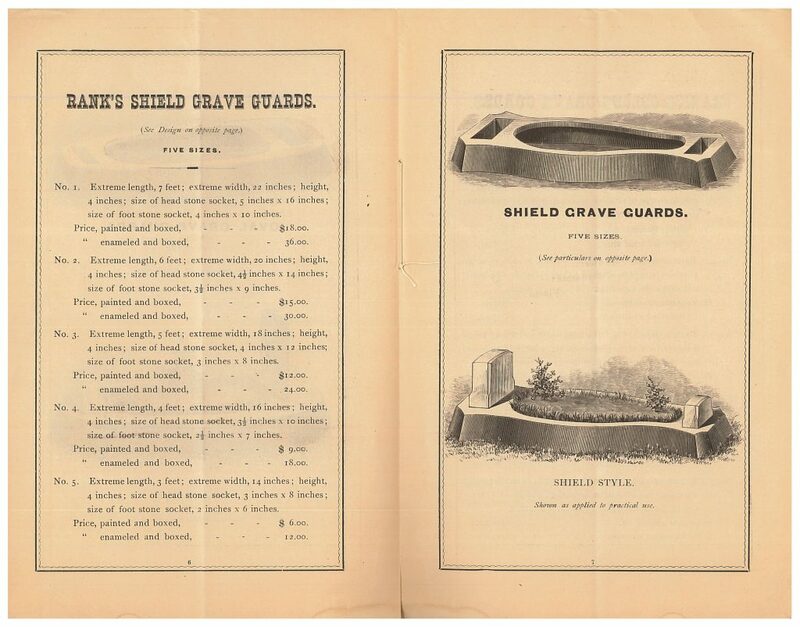 The catalog is entitled Illustrated Catalogue of Rank’s Grave Guards Designed for the Purpose of Preserving the Symmetry of Burial Mounds, and Holding the Usual Head and Foot Stones More Securely and Permanently in Position (1875). Amos Rank & Co., Salem, OH. 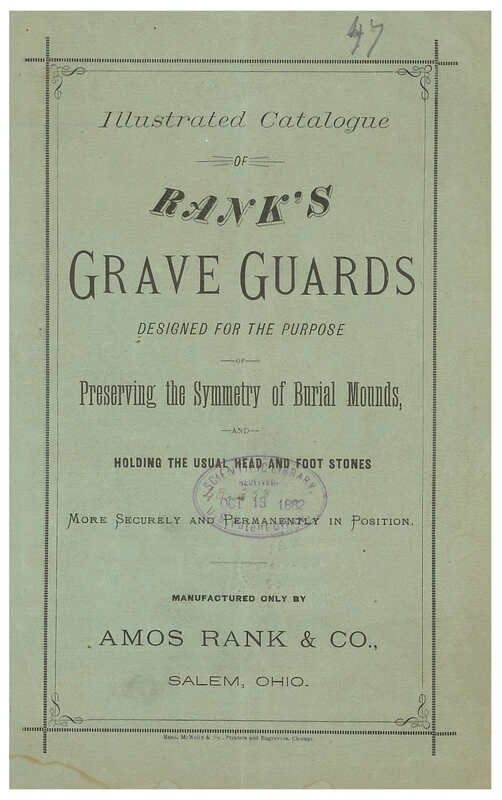 Illustrated Catalogue of Rank’s Grave Guards Designed for the Purpose of Preserving the Symmetry of Burial Mounds, and Holding the Usual Head and Foot Stones More Securely and Permanently in Position, 1875, front cover. The catalog title explains it well. Rank’s Grave Guards protected the grave, gave it symmetry, and helped to keep the headstone and footstone standing upright. It consisted of a low wall surrounding the burial mound. At either end, there were standard-sized rectangular slots to place the headstone and footstone in securely. Earth filled in the center where grass could be grown. There was also the option of planting flowers, shrubs, or creeping vines in the central area. Amos Rank & Co., Salem, OH. 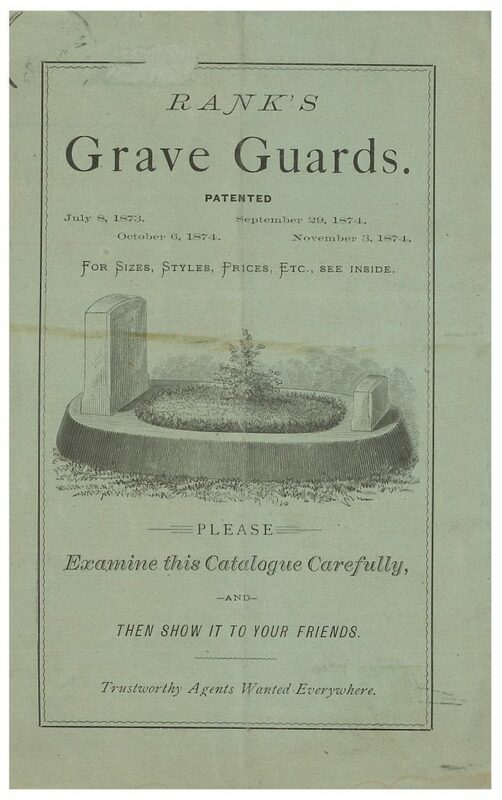 Illustrated Catalogue of Rank’s Grave Guards Designed for the Purpose of Preserving the Symmetry of Burial Mounds, and Holding the Usual Head and Foot Stones More Securely and Permanently in Position, 1875, back cover, grave guard. Rank’s Grave Guards came in several shapes and sizes. The four styles or shapes were the oval, shield, oblong, and square. Shown below is the Shield Style with a grave guard wall of four inches in height. This example also shows the option of planting something in the central grassy area. There are two small shrubs on either end. Amos Rank & Co., Salem, OH. Illustrated Catalogue of Rank’s Grave Guards Designed for the Purpose of Preserving the Symmetry of Burial Mounds, and Holding the Usual Head and Foot Stones More Securely and Permanently in Position, 1875, pages 6-7, Shield Style grave guards. Another option was to not plant anything in the central area and leave it open with just grass. This is illustrated in the image below showing the Square Style grave guard. Amos Rank & Co., Salem, OH. 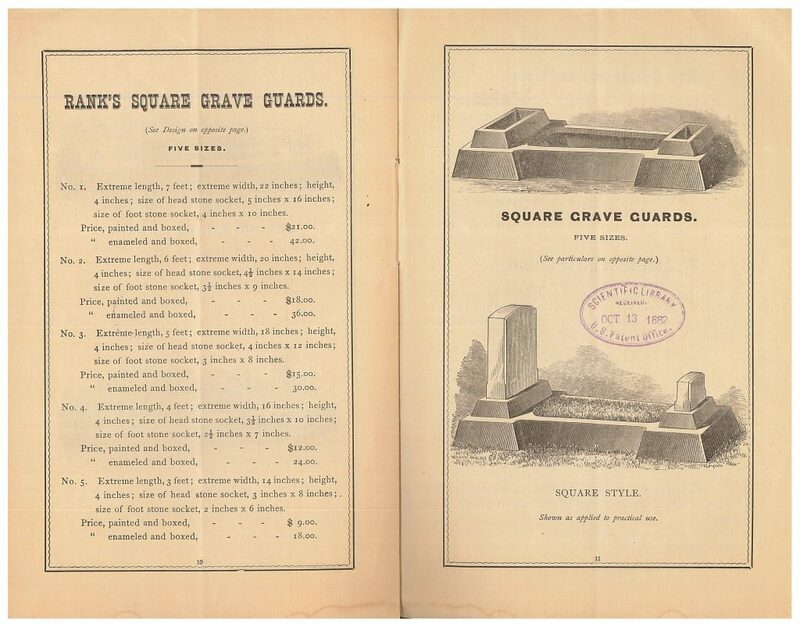 Illustrated Catalogue of Rank’s Grave Guards Designed for the Purpose of Preserving the Symmetry of Burial Mounds, and Holding the Usual Head and Foot Stones More Securely and Permanently in Position, 1875, pages 10-11, Square Style grave guards. Most of the time, it was possible to set up the grave guard immediately after interment or at other times as well. The grave guards were made of metal and finished in paint or enamel. This 1875 trade catalog by Amos Rank & Co. is located in the Trade Literature Collection at the National Museum of American History Library. Many more undertakers’ related catalogs can be found in the collection including ones about coffin hardware and fashion for the deceased. How do I go about reading this entire booklet? Is there a link? Thank you for your interest in this collection item! Unfortunately, this piece has not yet been fully digitized (though it may be one day) and it doesn’t look like other libraries have scanned their copies yet either. We’ll let our Digital Library staff know there is interest in this piece!